NEW YORK — The newest cosmic toys under the sun will be on display at an international convention kicking off this weekend. The 111th New York International Toy Fair runs from Feb. 16 to 19 here in Manhattan at the Jacob K. Javits Convention Center. Toys, games and other gadgets will be showcased from more than 1,000 makers from around the world. Mattel, Hasbro, LEGO and other big names in toys will all have a presence at the conference. Toy Fair is not open to members of the public. Only media participants and exhibitors may attend. 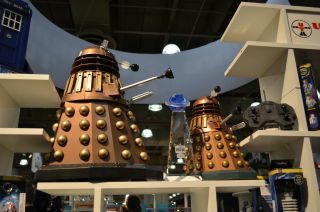 Space.com will dig through all of the model spaceships, action figures, space toys and robots to find the best that Toy Fair has to offer in celestial fun. We will be handing out our third annual Space Age Toy Awards celebrating the coolest new gizmos in our six original categories — Best High-Tech Toy, Sci-Fi on Earth, Cosmic Space, Little Scientists, Retro Future and Do-it-Yourself Science — plus one new category: Amazing Robots. The winners of the awards will be announced on Feb. 19. Last year's Space Age Awards recipients were spacecraft models from Papa Foxtrot, the Romo robot by Romotive, the remote-control "Doctor Who" K9 and Dalek from Underground Toys, Nancy B. 's Science Club MoonScope from Educational Insights, the Crayola Marker Maker, and the Smart Cubs, Cody and Cora, by VTech. Who will be the lucky winners this year? Check back with Space.com next week to find out.